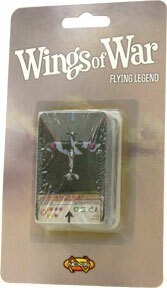 Boost your games of Wings of War: The Dawn of World War II! The "Flying Legend" Squadron Pack allows you to field three Supermarine Spitfires, one of the most archetypical WWII Allied airplanes. Three "A" Maneuver decks are included, as well as 18 different airplane cards, including Spitfires with Czech, Polish, Portuguese, American, and New Zealand pilots. Also featured are two specimens flown by the Luftwaffe after their capture! This is not a complete game. A copy of Wings of War - The Dawn of World War II is necessary to play.